The emerging workforce is focused on impact. More young people than ever are graduating with strong track records of community service and considering the societal impacts of their potential employers. The steady rise in nonprofit work, the increase in startups & social enterprises, and the proliferation of corporate social responsibility & sustainability roles in the private sector are signals of a more enlightened workforce. Impact work isn’t limited to just nonprofits anymore… it’s spanning across the sectors and attracting a variety of professionals. What is one piece of advice you would give to a nonprofit or social impact professional just starting their career? Put serving your community first, your organization second and yourself third. Our society needs young leaders who are willing to commit to strengthening our communities. By doing so, you will gain valuable experience and perspective that will benefit you and your career. Working to create social impact is arguably the biggest gift you can give yourself in life. To work with purpose means to engage not only your mind and body in your career, but your soul too. The days and years fly by when you can create a career that fulfills your soul. This soul engagement thing is important because non-profit and social impact work is a marathon, not a sprint. Make connections and intentionally build your network. Professionals who devote their careers to social impact are a passionate lot, the advantage is typically once they are in the field they don’t leave it – so the contacts you make today will be part of your network for years to come. While cultivating your connections be mindful of what their goals are and how you can connect the dots in your network. It’s a small and very interwoven group, so always take the high road, do your best work, and maintain a sterling reputation. Join and actively participate in associations in the social impact space you are passionate about. Get involved, get known, always follow up with contacts made. My advice is savor every one of the seconds, minutes, hours, days, weeks, months and years that add up to the marathon that is social impact. It doesn’t happen over night, but tomorrow can always be a better day for your cause. And remember the beautiful thing about true social change is it takes a village. No one person can take credit for any meaningful impact in the world. The change happens as a result of the team effort, working together. Welcome to the team. Master learning agility! It is both a mindset and a skill set that includes being open to new ways of thinking and learning new skills. It is the ability to process information and situations quickly and adjust on the fly to changing conditions. It is important because it will enable improving your skills, allow you to adapt in challenge situations, and eventually help you be a successful professional. Techniques that strengthen your learning agility include taking stretch assignments, meditation, keeping a daily journal for reflection, learning from mistakes by asking how to improve versus blaming yourself or others, and incorporating creative thinking when designing strategy or programs alone or with your team. In my life I have been blessed to be in creative places. As a college student, I worked to rebuild a campus-wide service program. As a recent college grad, I walked throughout the country seeking to rebuild a student movement based on community engagement and social justice. By discovering my heart and articulating my passion, I found myself myself at my beginnings, and then was able to continue to extend a hand and make my footprint on programs and initiatives like COOL (since renamed to IMPACT), National Youth Service Day, Teach For America, Americorps, and the Bonner Foundation. One result of this is that many young people (and some older ones) come to me and share with me their big ideas and their desire to make bold moves. I always try to make room for anyone who seeks me out. What I want you to know is that it takes about thirty seconds for me to interpret the conversation. My intuitions are not always right, but it often doesn’t take long to get a sense of where someone has been and where they might be headed. And here’s the number one thing I listen for: the use of personal pronouns. When someone comes in and starts saying “I” and “me”, it’s a huge red flag especially when it comes to community and nonprofit work. It sets the trajectory. It’s building a skyscraper… a little off at the foundation, and you’re way off at the top. Listen to yourself. If you use personal pronouns to talk about your work, then think about why you do it and how you might change it. This measure doesn’t have to be the ‘be all and end all’, but the direction of your first step in a long journey usually has an impact on where you end up. Talk to as many people as you can. There are so many social entrepreneurs out there with unique approaches to solving social and environmental problems. It’s important for you to know the landscape so you learn from their experiences, figure out what type of work appeals most to you, and set the stage for collaboration down the road. No matter your age, background, education level or socioeconomic status, you bring value to your community and organization. Never forget that. There will be challenges and barriers around you while you attempt to make the change that you seek. Acknowledge them and learn how to appropriately maneuver around the situation on your path to growth. Ultimately, your nonprofit experience is what you make it out to be, not what someone else tells you it’s going to be. There are definitely influencers and obstacles within the construct of any organization but don’t let that hold you back or slow your own progression. Often times, non profit leaders are inundated with several responsibilities and you may be asked to take on new or unfamiliar tasks. Don’t be complacent, seek to learn and grow by asking questions and getting as much hands on experience as you can. This drive has to come within so do not rely on your colleagues to set the path for you. One of the best ways to handle this is seeking to be comfortable when feeling uncomfortable in new situations and tasks. When you’re uncomfortable, you’re most likely working on a weakness (talking in front of a group, training others, writing a blog, planning an event, etc. ), so be cognizant of any weaknesses and take advantage of perfecting them with the goal of growing your comfort list of skills. Remember, you are in the nonprofit industry to make a difference. Use this to light the fire of your passion to excel as you make an impact in your organization and community. If you’re just starting out in your career in the sector, budget time and money to learn fundraising and marketing. Do it even if right now you don’t think you’ll possibly need either. Fundraising will show you how to generate revenue for your organization. Marketing will show you how to connect your organization with the interests of supporters and community members. Knowing how to generate revenue and how to communicate the work you’re doing will serve you wherever you decide to go in your nonprofit or social impact career. My biggest advice is to not “silo” yourself. Some of the best, most helpful lessons I learned as a young program staff member were sitting around the table at the end of the day stuffing envelopes with the Director of Development or getting to know the Office Manager over lunch. Today, as President & CEO of a nonprofit organization, my passion for programming comes through in my grant writing and donor engagement. And by having an understanding of and appreciation for the office administrative needs, I can do a better job with budgeting, bookkeeping, and database management. Especially in small nonprofits, we have to function as a team, and having exposure to different roles and responsibilities early in my career has been invaluable. Never stop learning. Surround yourself with smart people and immerse yourself in smart resources. Marry rich. And, skip grad school. Instead, go work for a small to medium org and learn all the things. Be the first one there in the morning and the last one to leave at night. Ask questions. Work hard. Be in the middle of the product or service itself, right there with the clients. And smile often. The biggest single piece of advice I would give to social impact professionals is being able to get your head around the ‘whole’. And by the ‘whole’, I mean understanding both sides of the equation. I’ve had a couple of careers in different nonprofits and what I all too often have seen in my experience, either as a director or board member or a chair for a nonprofit, is that we get caught in the trap of “either / or”, “for / against” on one side of an issue or the other. It’s a trap we’ve been caught in for far too long, when many of the people we are fighting “against” actually have legitimate needs that need to be addressed somehow… or that that resistance, that fight, that opposition isn’t going to go away and we aren’t going to get to a solution that’s sustainable over time. Here’s an example: the organization I’m a chairman of is an organization committed to stopping dams. And they’re really good at it. 30 years ago, that was a really important thing and it’s still important today. They do this because we need to come up with sustainable alternatives for energy, flood mitigation, and natural resource management that dams promise, but simply don’t deliver on. As a part of our work our organization brings alternative solutions to the table because we need to be prepared to speak to people on all sides of the equation so that we can solve the ‘whole’. Great leaders see the ‘whole’, really appreciate it, and then figure out how they can intervene most successfully in the system to put it back into balance in a sustainable way — one that works for the stakeholders involved. If we don’t solve with this inclusive framework in mind, then the disempowered stakeholders will push back. And you’ll be right back in the battle. And by the way, this doesn’t just apply to the dam examples — it applies to food, water, energy, poverty, and virtually all issue areas. Disenfranchised groups, especially in this age, are perfectly capable of pushing back with political actions, organizing actions, and even terrorist actions. This is why it’s so important to solve for the whole. And it’s completely possible. It’s just that most people aren’t doing it yet, and that’s what this work is all about! For anyone starting out their career as a nonprofit professional my advice is to be prepared to work very hard, meet some amazing like-minded people, engage in meaningful activities that have a direct impact on the communities that you serve and, most of all, be ready to go with the flow. It is also incredibly important to pace yourself and always remember to insist on a good work/life balance for you and your family. Non-profits are unique organizations that have the wonderful advantage of drawing people together for a purpose bigger than themselves. When both human and financial resources are stretched, which they usually are in NPOs, it is critical to engage as many people as possible in your organizations mission and purpose. Use that unique purpose to connect and build your team. Regarding the one piece of advice I would give to a nonprofit or social impact professional just starting their career, I would encourage them to network deeply into the cause community, so they can meet, socialize and learn from others in the same career path. It’s so important to find a support community and to walk in the footsteps of people who have come before us and have faced similar opportunities and challenges. Identify leaders and innovators in your industry and learn from them. Follow their work and thinking online. If you can, build a relationship with them and tap into their network, knowledge, and abilities. Your career and impact will accelerate if you surround yourself with people who you admire and look up to. DO what feels like fun – go there always. You’ll find the right path for you that will perfectly suit your skills and interests. Don’t waste time in a dead-end situation where you are not encouraged, where there is infighting or competition, where your boss holds you back. Go ahead and LEAVE! Patience, pliability and self-care. Driven by passion and purpose, often the inevitable bumps in the road can feel like a universal injustice. Keep your vision but remain responsive and adaptable. Choosing a mantra of inspiration and resilience can go a long way in those moments. And a steady routine of self-caring practices will keep your nervous system more ready for a long journey to your success. Show up. Add value. Celebrate others’ work. There have never been more options to make an impact than today, but sheer breadth of choices can bring about inaction. I would encourage any young professional to follow that “hell yeah!” gut feeling and focus on giving that one meaningful endeavor with their full passion. I encourage them to lower their “am I making the right choice?” hesitation and instead remain aware that it will only be one page of the many they will write in their book of life. Risks like these will not determine your future (unless it is a wild success! ), so make sure you take time to stop throughout the process to learn from it, to build new awareness of what is truly important to you and to the society that surrounds you … and have a great time making it happen. And don’t go it alone — work with the best people you can find around you! Avoid your blind enthusiasm for your project not allowing you to see the downsides. No matter how good the cause or the idea, it will require resources to make it a reality, and there is always a limit on these. Before starting, you should see what resources you have available, and in a worst case scenario ask yourself: are these enough to achieve the desired result? You should hope for the best, but always plan for the worst. This way you are more likely to succeed. My recommendation to any nonprofit or social impact professional is to move slower than you want. It’s better to have a few skills and services that are extraordinary than to provide more skills without the same level of excellence. Adding services and skills will come naturally and organically. I would encourage young leaders to look to voluntary leadership positions with associations, membership organizations or collaboratives as a way of honing their leadership skills and expanding their professional network. I would also encourage younger leaders to establish a “kitchen cabinet” of advisors or even just one or two “mentors” who can provide career advice and guidance in the future. My advice to someone starting out is to take risks and challenge oneself to cross boundaries of all kinds – economic, cultural, political, ethnic, and social – as in the end it will enable you to better understand the world and the issues you are trying to address, to work effectively with and inspire people, and to access the ideas, resources, and networks that will pave the way to success. This likely translates into needing to confront various fears, but if you do it early and often, you will overcome them and grow. So, for instance, if you bring the perspective and experience of someone with fewer financial resources, don’t be afraid to seek out individuals with financial means. If you bring those means, it’s important to engage others who don’t share them and understand how they experience the same situations (whether, for example, understanding issues like economic development poverty reduction or mastering concrete strategies and skills like cultivating donors). The same goes for any of the other dimensions of diversity. In the end, your success and happiness as a nonprofit and social impact professional will be tied closely to people and to the quality of the relationships you have. 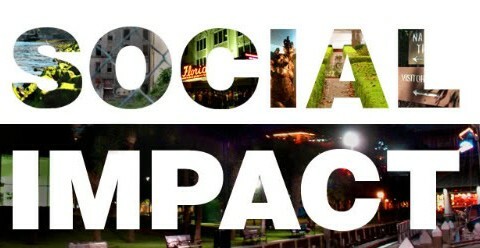 Do not use the word social impact. Write a handwritten thank you note to any donor, staff from the janitor to the ED, Board member or person or has come in touch with you. Numbers make people numb. Tell the story. Do not hide behind data. Agencies lose their soul when data reigns. The one piece of advice I would give nonprofit/social impact professionals just starting their career (or even in school before they start) is to double down on understanding and building expertise in both business and tech. The future of social change lies in tech products that enable impact at scale; in for-profit businesses that are built to address social issues but don’t have to worry about begging for donor money; in organizations that value failure and iteration rather than sticking to the status quo. Being able to pair a passion for social change with tangible business/tech skills will make up and coming professionals much more impactful throughout their careers. Specifically for a nonprofit fundraising professional, take the reins and don’t be afraid to lead. Nonprofit fundraising is an art and a science, one that your board members, staff, and executive director most likely don’t yet understand. They’re looking at bright shiny objects and instant results. Your job is to get everyone on the same page by educating them to the joy of fundraising and growing individual relationships. This includes data, processes and making the time – and spending the money – for solid systems. Think about ways you can include your ED and board in training opportunities, such as a Basics & More course. Persistence and leadership are key. Practice self-love and self-care first, because connecting to others requires being connected with yourself first. Not-for-profit professionals are most of the time very giving people. Giving is great and I am all for giving it your all, especially if you’re working for a greater cause, but you need to include yourself in that giving. Taking care of yourself and being connected with yourself is necessary to stay aligned with the ‘why’ you’re investing so much of yourself in a certain cause. It keeps you connected with your inner motivation. Find 3-4 people with your ‘potential’ dream jobs. Write their names/jobs across the top of a whiteboard. Then, find their bios (or interview them!) and map their career steps backwards vertically under their names all the way down to college and early/career. You should now have a full whiteboard. Towards the bottom, you’ll see the work/roles these rockstars were engaged with early in their careers. Ideally you might also see some overlap. Where it overlaps might be your best next step/direction – as it doesn’t limit you to one career direction, but moves you up and closer to a potential dream job. At the very least, you’ll have some ideas on how people got to where they are with smart, early career steps. It is important that you have a clear description of the focus or mission of the nonprofit you are working to develop. Have always in mind those who you serve. Leave any ego aside and help to achieve your goal/mission will come. Be authentic and tenacious!!! Believe, work hard, and you WILL achieve. I would say it’s definitely important to think outside of the box. Don’t let closed doors discourage you. For example, I directed my own amateur documentary on colorism even after my school denied me funding for it. How did I do it? I took things into my own hands, got hold of a camera and did my thing. I have many more examples of life’s derailments turning out way better than expected. Sometimes, when things don’t go according to plan, the actual plans are often bigger and better, you just have to be willing to be uncomfortable and take the road less traveled. Think of something you did for the organization that would not have happened without your involvement. Perhaps you came up with an original idea, you played a role in developing the program, or you were active in the execution of the project. Keep track of that effort and be prepared to talk about it. Make sure that your supervisor and her/his manager know precisely how you contributed to that success. Mention it to others outside the organization as an achievement. Then step forward to get involved and do this again and again. There are a lot of good ideas in the world, and there are a lot of people with good ideas. But very often, the ability to address a problem or need with an idea comes down to whether there is an institution in place to do the work. By institution, I mean a legal entity that can raise money, spend money, hire staff, apply for grants, and administer programs. These institutions should be guided by a group of dedicated citizens, and typically this group is a board of directors. Developing and sustaining an institution is critical to the long term health and viability of community based solutions: creating a lasting impact requires groups and organizations who can do work for the long haul. For nonprofit and social impact professionals, the true challenge is addressing a need today while remaining mindful of how to continue the work tomorrow. Working in and around the nonprofit sector requires a different kind of perspective about work-life balance. But that doesn’t mean forgoing a personal life or becoming a martyr for your cause. Instead, the people who are happiest in this work seem to be the ones who find ways to integrate their work and personal passions, and to live them both more seamlessly. Don’t forget yourself on this journey. As someone dedicating yourself to an incredible cause, you can easily prioritize everything but yourself. Do good, but do it better by remembering the big picture and the long game. Check in often with yourself on your “why”, set boundaries, frequently, for yourself and others. Self-care and ensuring our work is sustainable from a financial and workload perspective is not only not selfish, it’s non-negotiable for you having the biggest impact possible. Nonprofit founders and professionals need to remember that while founding a new nonprofit to meet a specific need is laudable, it might be worth considering partnering with an existing nonprofit instead. In a world of limited resources, nonprofits spend a lot of time competing with each other for talent and resources but instead they could engage in partnerships that take advantage of organizational economies of scale. I started working in fundraising right out of college and it’s been a great career path for me. I love doing work that benefits others, but one thing that I realized early on is that I needed to have boundaries with work in order to avoid burn out. Find ways to leave work at work and cultivate hobbies and interests outside of your job. If you find that you’re at an organization that doesn’t support this, don’t be afraid to leave. Plan to become an expert in many areas, from program outcomes to nonprofit finance, as roles in the nonprofit sector don’t tend to stay cleanly in one area. The more you learn, the more impact you can make and the broader the leadership opportunities. Community defines and inspires social change. In community, we learn from each other and come together to create change. My advice for professionals just starting their career in social impact is to always seek ways to build community with peers, staff, volunteers, patrons, and other organizations, local and national. Be thoughtful with your words and actions to connect people, challenge perspectives, and move our collective work forward. This field can be difficult and isolating at times, but the opportunities we provide can be life changing. Find your people to help you thrive, keeping going, and remind you why you got started. In your twenties be prepared to work very hard. Executive positions and a high salary are earned through years of building your experience and understanding of how the nonprofit sector succeeds and fails. As far as nonprofit technology, don’t underestimate the power of excelling at the basics: the ability to write good website and blog content, mastering mass email communications, and understanding the power of a well-designed fundraising page. Build and communicate a personal brand that highlights your skills, character and experiences. I built mine through my blog and professional speaking. You may choose a different route. Just make sure that people know where real power comes from: you. Know your weaknesses and learn how to ask for help and get help when you need it. Pride and stubbornness are not virtues. Humility and awareness are. They will serve you well whatever you do. Become the best communicator you can – both in writing and speaking. You may never be Stephen King (or Martin Luther King for that matter), but the better you speak and write the faster you’ll rise in anything you set your mind to. From my observation of and interaction with successful social impact professionals, I discovered seven characteristics they all have in common: vision, boldness, being willing to risk it all, passion, commitment & sweat equity, innovation & creativity, and leadership. When we observe successful social impact professionals, we sometimes take a snapshot of their current circumstance and pay attention to all of the trappings of success. However, what is not always evident are the countless hours of working night after night, day after day, and staying the course in order to achieve their vision. As a successful social impact professional, you must be able to be mentally, emotionally, and socially ready to lead. You must be prepared to make tough decisions, and take full responsibility for driving positive outcomes always. For all those social impact professionals that have shared with me your experiences, I say thank you! Keep forging ahead, breaking barriers and making the world in which we live a better place. Specialize. Dedication to social impact and social change is absolutely fundamental, but the advancement of nonprofits and leadership for social impact organizations depends on people who bring a specialized knowledge and tangible expertise to the field. It can be a related field, but know something and know it well. Specialize by skill, knowledge, or experience whether it is technology, human capital, agriculture, health, economic development, business, alternative energy sources, or even further specialization such as communication technology, human capital resource development, agricultural diversification in rural states, venture capital support for small business deployment, geothermal energy sources and investment. Social impact initiatives crave professional leaders whose resume builds their brand in their field. I learned early in my career that social change doesn’t happen through nonprofits alone, but rather takes a blending of sectors and approaches to drive large-scale impact. I’ve chosen to surround myself with people from different fields, disciplines, and walks of life. And, I’d give the same advice to those who are starting their careers. Build your own unconventional network of doers and thinkers — the people you can call on when you have questions or need guidance. Then find ways to reciprocate and help support their work in return! Really, truly know your values. And then don’t compromise on them. Ever. For anybody. The best way to figure out your career isn’t by looking forward, i.e. planning for the future. It’s by visualizing yourself rocking on your porch when you’re 100 looking back on your life. What do you hope your career will have looked like? It offers a completely different perspective and one that is largely more in line with your values than looking forward. Show gratitude. Say thank you. Not just for big things, but for all the small things as well. Did someone make more coffee without being asked? Say thank you. Did someone refill the copier paper? Say thank you. Did someone point out a typo you didn’t see? Say thank you. It’s pretty much impossible to over-thank people. In my work, we’ve created a methodology for change called the three “I’s”: Inspire, Inform and Impact. It is always better to start with an inspiration than with the classical approach of problem solving. Don’t find a problem you want to fix — find a dream that can inspire the power of networks. My best advice is to make sure your nonprofit business model includes the power of networks: it is an essential step for your enterprise to reach unprecedented scale. When you’re working day in and day out to make a positive impact on the world, it can be easy to lose sight of the impact this work has on you. Make sure to set aside time for self check-ins. Are you getting enough sleep? Keeping a balance (however you define it) between your personal and professional life? Celebrating your progress and little wins? Keep in mind that if you stop taking care of yourself, eventually, you’ll be unable to care for others… but by being your best self, you’ll be best able to better our world. Mission driven work is inspiring and mobilizing and organizing around purpose can be incredibly fulfilling. But, the work can also be hard, tedious, and sometimes even heartbreaking. You won’t win every battle, but it’s a long game. I’ve found that the journey is better when you travel in a pack. Find good mentors to watch and learn from. Listen to their stories and ask how about how and why they made their decisions. But, remember they are human too. There are lessons to be found in how they navigate their shortcomings and those can be as important the ones that come from their big ideas. Stick with the ones that have integrity. Find good peers. Talk about what you are experiencing, learning, and where you want to go. Ask them to challenge you. Share in their victories and be there to encourage them in the enviable set backs. But, if I had only one piece of advice to give and I had to say it in one sentence, I’d simply repeat the advice I was given and keep coming back to (sometimes daily): be strong and brave. Follow your passion. Work somewhere with a mission you believe in and people you can learn from and enjoy spending time with. Culture counts! First of all – Congratulations! You are starting out in a wonderful, creative, sometimes frustrating, often rewarding, line of work, and I commend you. Second of all – Let’s get real. This work is going to be very hard. A lot of people out there are not going to understand what you do and why you do it. They are going to come at you with questions, with skepticism, with cynicism in their hearts. Nonprofit professionals have to get up every single day and work on issues that may very well not be resolved in their generation – or the next one. It’s important that you take some time for self-care and for reflection, whether that be each day, or each week. Know that there will always be one more grant left to write, one more donor left to thank, one more tweet left to send, one more client report to file, etc. – the work is never done. And that’s ok. Take some time to network and connect with others in your same position. Vent. Take a walk. Go dancing. Do not feel guilty for taking care of yourself. And thank you, thank you, for the important work you do every day! You are appreciated, and you DO make a difference. Keeping balance and an open perspective is key to having deep, lasting social impact. Finding and holding the balance between the passion and creativity for your cause with the groundedness of your being, while taking care of yourself as you care deeply and fight for others; and understanding what truly causes positive change as you seek clarity and insight from diverse perspectives that see deeply and widely will serve you and your cause well. From this place of balance and perspective, you will be guided by the truth as it emerges. From this place, you will act and speak the truth that needs to be spoken on behalf of the whole. Social impact requires a deep understanding and comfort with systems. Hard social sciences like economics have tried to simplify systems into easily manipulated models, while on the other hand, politicians talk about what the system ideally should be and do for its people. In between there is a huge middle ground occupied by bureaucrats, data scientists, artists, community boards, and more. As a social impact professional, you must find ways to connect your own models and goals for the system with all these other players. My advice is to get in the door! Zero in on an organization that does the work you are passionate about and do whatever it takes to get in the door. They aren’t hiring for your dream job? If they are hiring for something you are even remotely qualified for- go for that and take every stretch opportunity there is. If you give 100% to the work you’re doing and they see you are committed they will try as hard as they can to retain you which often means crafting a role that suits your strengths and passions and in the long-term finds you doing exactly what you want to do. Who knows, you may surprise yourself and find a type of work you didn’t know you would love in the process.